Because we host so many on Easter Sunday, I need to set several tables and it is important to me to coordinate them but allow them all to stand on their own. For this post, I am sharing the table setting for the “big kids” (aka…the teenagers). One of my favorite color combinations for spring is pink and green, so that is what I decided to run with. I already had this great moss table runner from an Easter table setting I did last year. It really sets off the centerpiece! My rattan chargers were perfect to use for the place settings. This antique table was given to my great grandmother in 1900 for her wedding gift and it retains such a beautiful, rustic patina and I really like to let it shine. This is one reason what I did not use a tablecloth or placemats for this application. Besides, the moss table runner takes up quite a bit of visual space on the table. Besides blogging, I also own a large staging business. Needless to say, I have an enormous amount of serving ware…plates, bowls, napkins, glassware, etc. I will admit that it makes it a lot easier for me to pull these table settings together without having to buy much. There are a few favorites though that I have featured here that I want to share with you. Last year, I bought these bunny salad plates from Pottery Barn (they still carry them!) and used them for my main dining room table setting. So, this year, I am using them again for both of my smaller tables. They were perfect because of the pink and green colors they feature! One of my favorite finds on this table is the fantastic green wine glass from THE DOLLAR TREE! Yes, The Dollar Tree. That means they only cost $1 each…isn’t that crazy?! I have used them over and over again and bought a ton of them. They can be used all year long! To tie everything together, I added the pink plates for the entree course. The blush pink plates were a huge find from IKEA. They were only $2.99 each!! I am so excited to use them for other functions! For the final touch, I added color coordinated pillows to my settee. They came from HomeGoods and will be great for bringing in some fresh spring decor for the season. Several items on this table setting I already owned and some of them are not available anymore, so I shopped this look for you here. For example, I bought the blush pink votive holders on clearance at West Elm. I found the blush pink wine glasses at a local antique store. With regard to the furnishings in this room, I had the settee custom made from ZGallerie, but I found several other similar ones below. My kids love hanging out there to work on their homework or to eat. The white chairs (that I change out regularly) are from IKEA and are temporary. I haven’t found my “dream chairs” for this area, but I will let you know when I do! Searching regularly!! The chandelier is from Uttermost and I just love it. The pillows are all from HomeGoods, so they were very inexpensive. 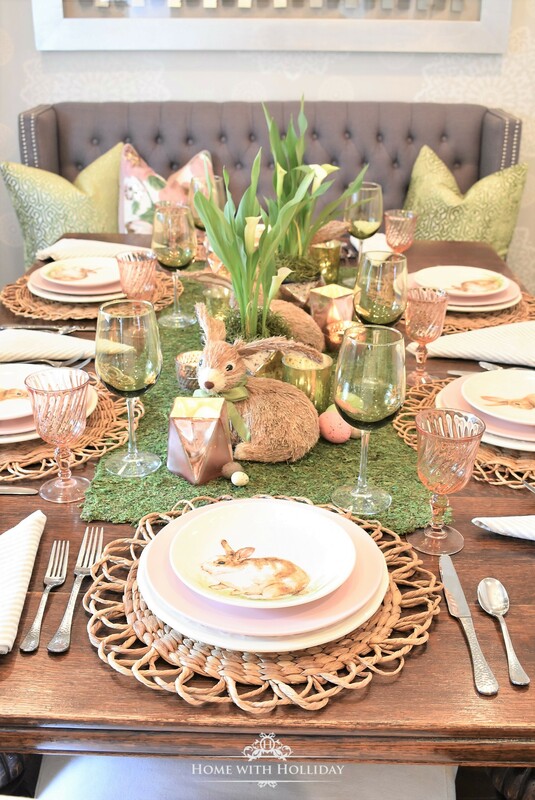 Thank you for stopping by today to see our Green and Blush Pink Easter Table Setting. Do you have to set up multiple tables for your Easter Celebration? I would love to hear your traditions in the comments below! !